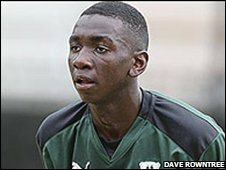 Plymouth Argyle winger Yala Bolasie has returned to the Devon club after a spell on trial at League Two side Dagenham and Redbridge. The 19-year-old joined the Greens during the summer but has yet to make an appearance for the first team. It was hoped that he would go out on loan to Dagenham in order to get some Football League experience. He began his career at Rushden & Diamonds and played for Floriana in the Maltese Premier League last season.